FLIR Systems has launched the FLIR T840, a new thermal camera in the high-performance T-series family. The high-resolution T840 offers a brighter display and an integrated viewfinder to help electrical utility, plant managers, and other thermography professionals find and diagnose failing components in any lighting conditions to help avoid costly power outages and plant shutdowns. Featuring the award-winning design of the FLIR T-series camera platform, the T840 features an ergonomic body, a vibrant LCD touchscreen, and a viewfinder that enables ease of use in any lighting conditions. 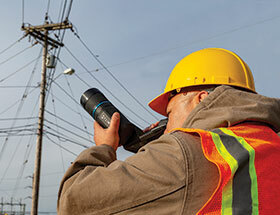 The 464x348-resolution camera incorporates FLIR advanced Vision Processing, including the patented MSX image enhancement technology, UltraMax, and proprietary adaptive filtering algorithms to provide customers with enhanced measurement accuracy and image clarity with half the image noise of previous models. The T840 also offers an optional 6-degree lens that allows professionals to capture accurate temperature measurements on small targets at far distances, such as connectors on overhead distribution lines. Also, advanced, on-camera measurement tools unique to newer FLIR T-series models, such as one-touch Level/Span and precise, laser-assisted autofocus, the FLIR T840 enables users to find problems and make critical decisions easily. With a 180-degree rotating lens platform, the T840’s ergonomic design helps users reduce the strain of full-day inspections and diagnose hard-to-reach components at substations and on distribution lines. The new camera offers rapid reporting features that help users stay organised in the field. Wi-Fi streaming to the FLIR Tools app makes it simple to survey issues in real-time, while in-camera GPS automatically tags image files with geolocation data to simplify identification for precise documentation.